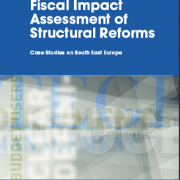 The country case studies in this volume represent just such an in-depth needs assessment for countries in the region, on an issue that is both critical and insufficiently addressed: how the fiscal impacts of structural reforms are integrated within the budget process. Working closely with Montenegro’s Ministry of Finance and with support from the World Bank’s SAFE trust fund, the Center of Excellence in Finance(CEF) identified authors with the right knowledge to assess the situation and offer recommendations for improvement. 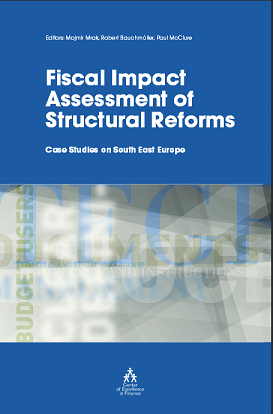 The Fiscal Impact Assessment of structural Reforms (FIASR) project is part of a long-term CEF program, Building Capacities for Policy Design and Implementation. The capacity development needs that the case studies have identified will be addressed through a series of CEF learning events entitled Strategic Planning and Budgeting from 2013 to 2015. For this study, the working group of AIS focused on the most important structural reforms undertaken over the last 10 years in five sectors: Enterprise, Financial, Human Resource Development and Labor Market, Administrative Services, and Network Industry. The main sources of data were taken from the Ministry of Finance, the Institute of Statistics, the Bank of Albania, line ministries and other responsible institutions, sector strategies, and the related legal framework in the five sectors examined, as well as signed agreements with other countries or international organizations. The European Commission’s progress reports on Albania and the reports from international organizations, such as the World Bank and UN, were also taken into consideration. This case study consists of four sections. The first introduces the methodology used for this case. The second introduces the process of budgeting, not only its importance but reforms made during recent years, the legal framework, detailed procedures, and the main actors of this process. The third section focuses on the reforms undertaken in key sectors, institutions, and processes to include the cost of structural reforms in the state budget. The last section gives some conclusions and recommendations for all of the issues treated above. Publication on the case study for Albania. Link to the complete publication.